Bafta-nominated actor Michael Sheen is the latest celebrity to support a campaign to save jobs at the Burberry factory in Rhondda, south Wales. Ahead of the Bafta awards ceremony on Sunday evening, Sheen said he "completely supported" the campaign. Three hundred jobs will be lost and work moved overseas with the planned closure in March of the Treorchy plant. 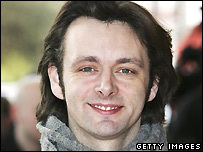 Newport-born Sheen is nominated for the best supporting actor award for playing Prime Minister Tony Blair in The Queen. Clothing firm Burberry has said it plans to close the site because it is not "commercially viable" but said it intended to continue UK production in Yorkshire. In January, the clothing firm announced a 22% increase in revenue and Burberry's total sales rose to £206m during the last three months of 2006. Sheen, who was brought up in Port Talbot, said: "At a point where Burberry are making good profits, closing the factory is just wrong." Sheen is the latest in a number of celebrities who have joined a high-profile campaign to keep the factory open. They include singer Sir Tom Jones, Manchester United manager Sir Alex Ferguson, actors Ioan Gruffudd, Rhys Ifans and Emma Thompson and singer-turned-TV presenter Charlotte Church. Rhondda AM, Leighton Andrews, who has been involved in the campaign, said: "I was delighted to get the call from Michael declaring his support." Earlier this month, Burberry pulled out of its planned sponsorship of a pre-Bafta party ahead of a protest over the factory closure. The awards, which will be hosted by Jonathan Ross, will be held at The Royal Opera House in London on Sunday. The Queen, starring Sheen and Dame Helen Mirren has 10 nominations. The GMB union is planning to stage protests outside Burberry stores in New York, Los Angeles and Paris on Wednesday as part of the campaign to stop Burberry transferring work overseas. In January, Burberry announced it would give the Treorchy factory to the community, effectively guaranteeing the plant's value at £1m by underwriting its assets. Burberry chief financial officer Stacey Cartwright said: "Our primary concern has always been to assist employees in Treorchy who are affected by the closure, particularly with finding new employment, and we continue to do all we can to help." 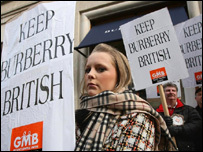 Burberry has said it does not intend to abandon the UK and it has offered Welsh staff jobs at other UK sites.